Some providers claim they are cloud-based but actually require you to download and install software onto the PC you are connecting from. You may not be able to use the system at all in certain situations.For example, computers that are locked-down and won’t allow downloads such as those in public places like hotel lobbies and airport lounges, or even a friend’s work laptop you just needed to borrow for a few minutes. You have therefore lost the benefit of a genuine, 100% cloud-based system that allows connection from any internet ready device without a download. That you’ll need to install updates across all the devices you use to connect to your system. This is time consuming, might be difficult for some people and is completely unnecessary of course in a genuine, 100% cloud-based system. It makes it harder for home workers – before they can log-in and take bookings for the first time they will need to go through an installation process. Are all of your staff technologically savvy enough to do this? Many aren’t. The installation of this non-cloud-based piece of software usually requires extra log on credentials – not just the user’s name and password, but details that are usually reserved for the business owner, which compromises your security. The reality is that if your new dispatch system is not 100% “in the cloud”, it isn’t going to deliver the benefits you want and need. You won’t be able to use it everywhere you want to, you’ll still have to deal with downloading and installing updates, your staff may struggle to install the system and it could be a security risk. All of which are non-issues with a genuine, 100% cloud-based system such as iCabbi. 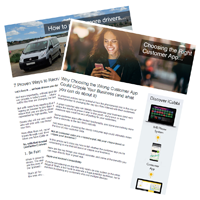 Request a free demonstration now to discover why iCabbi is the go-to choice for taxi businesses across the UK.